It is headed by Chris Cox, an experienced electrician with over 16 years experience in the electrical trade. Based in Glasgow, Scotland, we have been engaged in a wide range of commercial and industrial installations throughout the UK. We are accredited and approved by trade and quality association, the NICEIC. 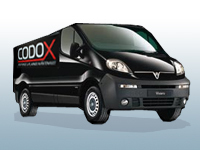 With a professional work ethic and a wake of satisfied customers, Codox are proud to be one of the best in the industry.